James Wilbur Barnett was born on May 22, 1926, in Huntingdon, Tennessee. He transitioned this life on Tuesday, September 18, 2018, at Hospice House of Elkhart County. James was the eldest of eight children born to James Gulfrey (Gulf) Barnett and Flossie Dean (Dupree) Barnett. James graduated from Webb High School in McKenzie, Tennessee. He was also the bus driver for the Webb School System. James served in the United States Army receiving an Honorable Discharge in 1946. On March 5, 1950, James married the love of his life, Felicia Delores Pearson in Corinth, Mississippi. Two children were born from their union, Stephen Lewis and Constance Lynn. James was employed by Whitehall Laboratories in Elkhart and retired in 1988, after 40 years of service. 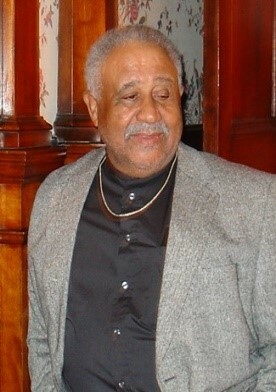 James was a member of Canaan Baptist Church for many years. He was instrumental in the building of Canaan’s current church located on Fieldhouse Avenue. Most recently, James was an active member of Agape Missionary Baptist Church, where he was a founding charter member and served on the Trustee Board of Agape from its inception. James enjoyed bowling and was in a league for several years. He also loved fishing, baseball and helping his brothers maintain the family farm in Michigan. James was also an engineer of sorts, who possessed the knowledge to fix just about anything that was broken. Family and friends never hesitated to call on him when repairs were needed and he never hesitated to share his skills. Those who called would barely have the phone hung up before James was at their door to lend a helping hand. He never met strangers, only friends. James was preceded in death by his parents, Gulf and Flossie Barnett, and three brothers, Warren, Willie and John Barnett. James is survived by his loving wife of 68 years, Felicia; son Stephen Barnett of California and daughter Constance (Connie) Dawson of Elkhart; five grandchildren, Brandon Dawson of Indianapolis, Felicia Dawson of Texas, Megan and Pierce Barnett of California and Robin (O’Dell) McFarland of Illinois; four great grandchildren; Jaylen and Drew Dawson, O’Dell and Zaria McFarland; two sisters, Eleanor Hill of Elkhart, and Margaret Branscomb of Arizona; two brothers, Bobby Barnett of Elkhart, and James Luther (JL) Barnett of Tennessee, and a special cousin, Horace (Marjorie) Barnett of Florida. Survivors also include a host of nieces, nephews, cousins and beloved friends.